We will present to you some of the images of what a winter picture is in our minds. These scenes come from locations around the world. Some are skiable destinations, and some places are there mainly to be admired. We will continue to do this, as often pictures speak a thousand words. May this get you into the winter mood. We will start with the forgotten Japan, Hakuba valley. If you are looking for the steepest terrain to ski out of Japan’s 600 ski resorts, this is it. This place is 65 min by coach from Nagano. A winter picture of a snow covered valley. This winter picture is from Gstaad, Switzerland. A prestigious resort which has over the years hosted a lot of famous individuals. I think it is a little pearl of this part of the world. If you want to cross the world and venture among the gum trees, well this winter scene is from Australia. More specifically the Mt Hotham region. 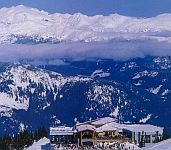 This sweet winter panorama of obscured fjords,is from the Cypress mountain, which is adjacent to Vancouver in the province of British Columbia, Canada. This is a top weekend retreat for a lot of Vancouver-ites. Spruce covered in fresh powder. Umm…sweet. I have no idea where this is? 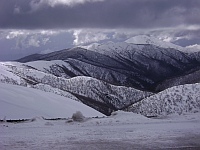 This shot is in the vicinity of Mt Hotham. 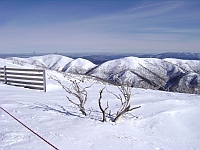 Outside Hothams Ski Resorts boundaries, Australia. 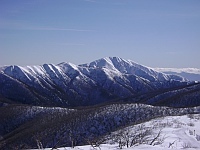 Looking towards Mt Feathertop, Australia. Few hours hike from Mt Hotham. In wintertime a two day return trip. If you have skied Europe, and even Americas I highly recommend Whistler-Canada, the scenery is great, resort huge, and powder guaranteed.In this winter picture we are on top of the Whistler Mountain looking down to the village. Let your imagination go ski vertical powder.Wow!There is a guy skiing this slope! Visiting Austrian Tirol. Scenery of church towers, quaint villages and valleys. This late winter pic, more like spring, is of the Jasper region in Canadian British Columbia. This area is about 60km from Banff, which is more suited to powder skiing. Soak up the Glacier Bay region when visiting Alaska. Look and admire but best not to ski, if you have a “breaking problem” you could be in strife. 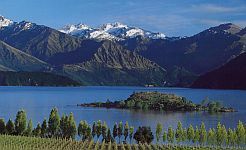 New Zealand, close to Queenstown, with the mountain peaks still in winter but foothills in early spring. We call this one “mother nature talking to you”.The new weather front is approaching.We think it was taken either in Canadian Rockies or Swiss Alps. Another panorama from Canadian Rockies, early winter time. 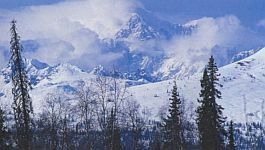 If you like snow capped peaks, check this page out, with awesome mountain pictures from around the world. From winter picture back to home page.